This weekend saw intense, close-quarter racing action as 34th America's Cup Defender Team Oracle USA and Challenger Emirates Team New Zealand faced off on San Francisco Bay. The high-tech AC72 multihull yachts showed off impressive performance in 15- to 20-knot winds on the Bay on the first day of racing. The futuristic yachts can sail at speeds in excess of 50 miles per hour. The racing action attracted tens of thousands of spectators to the shores and yachts moored along the racecourse in San Francisco Bay. Emirates Team New Zealand inched by Oracle to win the first two races of the America's Cup Finals by only 36 and 52 seconds, respectively, ending the first day with a 2-0 lead over the Defender. The second day of racing and Race 3 saw Oracle lose its 17-second lead it held before the upwind leg, and the Kiwis won the race by 28 seconds. The tides turned in Oracles favour for Race 4, with the Defender rebounding to win this race by only eight seconds. As Oracle started out with a negative score due to the International Jury's ruling, this puts the current standing at Emirates Team New Zealand: 3 and Oracle Team USA: 0. The first team to win nine points will claim the title of winner of the 34th America's Cup. 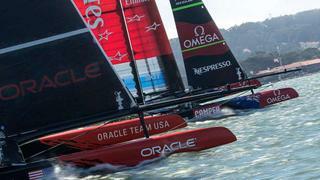 Team Emirates New Zealand must win six more races while Oracle Team USA must still win 10 races. Today, the AC72s will take a break while it's the turn of the superyachts to face-off in the inaugural America's Cup Superyacht Regatta. Stay tuned for results of the superyacht-racing action. The Superyacht Regatta will take place on 34th America's Cup lay days, 9, 11 and 13 September, while the Cup Finals will resume 10, 12, 14 and 15 September with two races taking place each day until a winner is determined.